Twin Peaks premiered on ABC in April 1990 and became a major surprise hit with critics and audiences. Unlike our current environment of groundbreaking TV, the shows produced at that time rarely followed a serial format and were not shot like feature films. Creators David Lynch and Mark Frost found a successful way to subvert the format and still draw huge audiences. The brief first season only included the two-hour pilot and seven one-hour episodes, but it packed a wallop. Closing with cliffhangers for nearly every major character (now a TV staple), this season remains a stunning experience for today’s audiences. In the second season, the mass popularity started to wane, with viewers frustrated by not learning the central mystery – who killed Laura Palmer? Lynch and Frost eventually caved to the pressure at mid-season and provided a solution. Whether that was a good idea or not is up for debate, but the ratings had dropped seriously by that point. ABC cancelled the series but did air the remaining episodes later in the spring of 1991. Although still intriguing and maintaining the unique tone, the quality of the second season varied dramatically, with some story lines lacking the punch of the first collection. Thankfully, Lynch had one last haunting spellbinder to deliver before Twin Peaks left the air. When producing Episode 29, Lynch wasn’t certain it would be the final episode, but it seemed likely. He’d been less involved in the second season, particularly near the end, but he returned to direct the season finale. It ended up being the last episode, though the prequel movie Fire Walk with Me did provide more details about Laura Palmer’s final days. The finale’s story mostly centers on Agent Cooper’s (Kyle McLachlan) attempts to save his new love Annie Blackburn (Heather Graham) from the clutches of the villainous Windom Earle (Kenneth Welsh). This search takes him into the terrifying Black Lodge, where the evil Bob (Frank Silva) and other horrors await Cooper. To save Annie, he may have to sacrifice both his body and his eternal soul. Watching the finale again now, I was surprised to realize that a good part of the episode takes place outside the Black Lodge. Most of my memories focused on Cooper’s experiences in the mysterious, red-curtained rooms. There’s also a fairly lengthy sequence at the bank where a slow-moving old employee staggers around the large room for an inexplicably long time. Using very long takes, Lynch shoots the arrival of Pete Martell (Jack Nance) and Andrew Packard (Dan O’ Herlihy) from such a great distance that you can barely see what’s happening. This comic scene drags for so long that the suspense grows for some unexpected disaster. 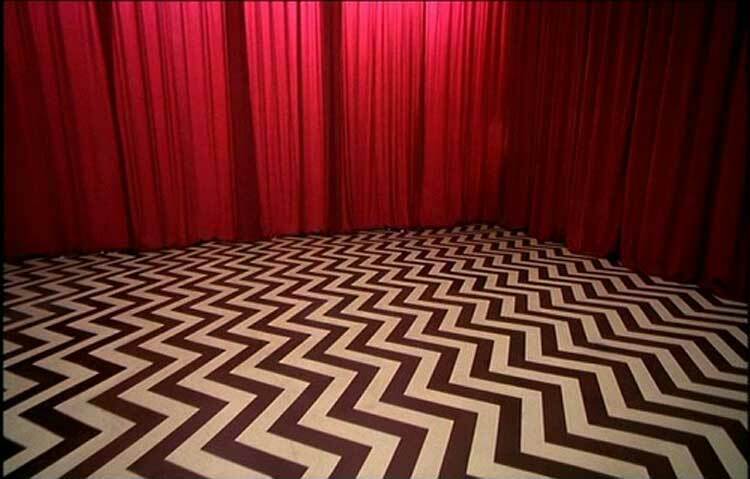 At this point, Cooper had just entered the Black Lodge, so it also shows how Lynch is screwing with the audience. We desperately want to see what’s happening down there, but instead we follow the supporting characters instead. He slows the pace to a near-crawl, leaving us even more exposed to the horrors ahead. The other story lines are enjoyable, but the reasons for this episode’s staying power are definitely the Black Lodge sequences. Initially, Cooper enters an odd “waiting room”, where he sits with the Man from Another Place (Michael J. Anderson) and has a strange conversation. This scene depicts Lynch’s absurdist humor at its best, and it sets us up for the menace to follow. Crossing through the red curtains into another room, Cooper encounters Earle, Annie, and the true evil of Twin Peaks, Bob. There are few characters in TV or film that I find more terrifying than Bob. His animalistic delight in tormenting souls and inflicting pain combines perfectly with Lynch’s menacing atmosphere. Watching Bob and Cooper’s double chasing him through the endless corridors remains frightening 20 years later. So what actually happens in the Black Lodge? Are we to believe that what we see exists in a physical sense, or is the battle occurring in Cooper's mind? Nightmares from the past return to haunt Cooper, including Earle's wife, who Cooper loved; both Laura Palmer and her cousin Maddie; and his nasty doppelganger. If we're to take what happens directly, Bob destroys Earle, who is a mere mortal among the spirits. It's likely that Bob lured Earle into the Black Lodge to ensare Cooper, who was the target all along. Annie was just a pawn in this vicious game, and even helpful forces like the Giant are no match for Bob's power. Twin Peaks closes with a sequence in a hotel room at the Great Northern that presents little hope for the future. 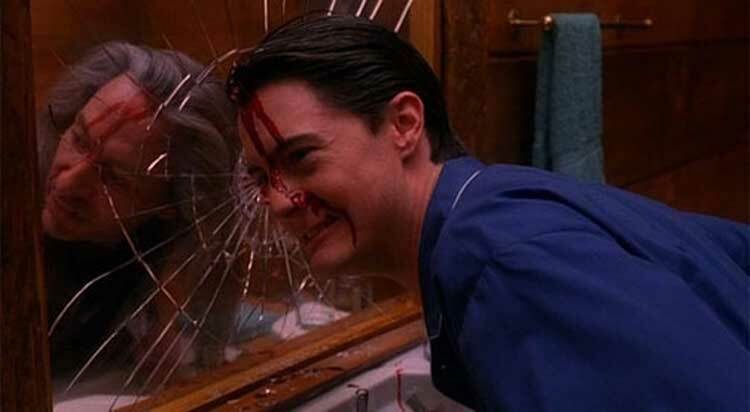 It confirms what we suspected from the Black Lodge – Cooper’s body has been inhabited by the ultimate evil. Slamming his face into the mirror and callously mocking the “How’s Annie?” question, he reveals that further mayhem lies ahead for the town. His first target will likely be Annie in the hospital, and then he'll focus on others like Sheriff Truman (Michael Ontkean) who might suspect his true nature. This ending works as both a vicious cliffhanger and the set-up for future stories. If a third season had occurred, it would likely have offered a fascinating look at how Cooper’s doppelganger continues Bob’s work. I can't wait to see what happens with the new season in 2017. I've read that Lynch suspected that a third season wouldn't happen, but it wasn't official until after the episode was shot. I do remember about the two-hour block and actually have a fairly clear memory of us watching it. 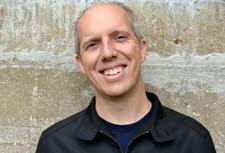 The second-to-last episode did have a different director, Tim Hunter. And you're right about those first 10 minutes, with the old guy and the giant and Cooper on the floor.I'm not sure it would have mattered, though. The viewing public can be fickle, and they didn't have patience for some of the odder second-season story lines. Remember James leaving town and staying at that random lady's house? Or Nadine becoming a high-school wrestler? Or Ben Horne hanging out in his room re-enacting the civil war? Just your typical TV drama. Loved that first episode of the second season! Actually the first few episodes of that season were great. Show didn't go downhill until after Laura's murder was solved. Black Lodge sequence was terrific but still puzzles me to this day. Much of that final episode was bleak, even outside of the Lodge--with Norma and Ed dancing (like the little man) while ignoring Nadine. The exact same scene in the diner from the pilot, as though none of the sacrifices of the whole show had mattered. Very much a downer. Brilliant, but a downer. The ending is quite a downer! I'm really curious to find out what happens in this new season, though I'm trying to keep my expectations in check.